Please call our office at 248-693-4800 to make payments over the phone. We accept all major credit cards! Dr. Sam Caruso uses chiropractic care to improve the health and wellness in all areas of patient's lives, whether they are having problems with back pain or neck pain, or just want to start feeling better when they wake up in the morning. Dr. Caruso takes a 'whole person' approach in chiropractic care, which means looking for the underlying causes of disease, discomfort, and pain, as opposed to just treating the symptoms. Many seemingly unrelated symptoms often arise from imbalances in the spinal column, and Dr. Caruso will be able to determine the root of the pain and create a personalized chiropractic and wellness plan to suit each patient's individual needs. Under the supervision and care of our caring and skilled chiropractor, patients report higher functioning in all areas of their lives. 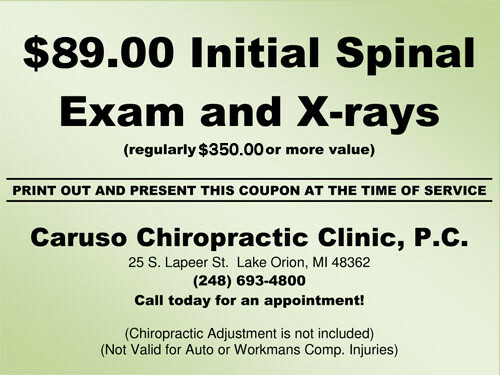 Dr. Brad Sabo is the newest member of Caruso Chiropractic Clinic, starting in August of 2011. Dr. Brad was born and raised in Southeast Michigan, residing currently in Shelby Township. Dr. Brad has cared for patients ranging from newborns and expectant mothers to patients in there 80-90's. His mission is 'To let no spine go unchecked'. He feels that the power that made the body can heal the body as long as the Nervous System is functioning at its optimal level through the removal of spinal misalignments. Marie graduated from Irene's Myomassology Institute in 2013 after completing 900 hours of instruction in therapeutic massage, trigger point therapy, soft tissue manipulation, reflexology and polarity. Marie has been working as a therapist for the last 6 years in a local Chiropractic office. She works in hand with our Doctors to create a massage treatment that will benefit each persons individual needs. She specializes in deep tissue, craniosacral, sweedish, back and neck. She strongly feels that when your include massage with a chiropractic adjustment you have the ability to eliminate subluxation in the spine and reduce muscle stress, helping to improve overall health. Frequent massages improves blood movement and nutrients through the body which will promote healing through increasing circulation, reduces swelling, relaxes thigh muscles and balances muscle activity. Alissa graduated from Lakewood School of Therapeutic massage in October 1998 after completing 700 hours of instruction in therapeutic massage, trigger point therapy, soft tissue manipulation, reflexology and polarity. Alissa has been working as a therapist for the last 19 years in a Chiropractic/Healthcare office. She carefully listens to the patients concerns and is able to adapt each massage specific to each patients needs. She specializes in whiplash, migraines, head, neck and shoulder issues. She strongly feels that when your include massage with a chiropractic adjustment you have the ability to eliminate subluxation in the spine and reduce muscle stress, helping to improve overall health. Frequent massages improves blood movement and nutrients through the body which will promote healing through increasing circulation, reduces swelling, relaxes thigh muscles and balances muscle activity. "Dr Sam is amazing he helped with my lower back pain and migraines. I would highly recommend the office and his caring staff." "As a patient of Dr Sam's for several years, I have come to know him and his staff. They are the best at what they do and sincerely care about their patients. His love for Chiropractic care is shown by his actions, after suffering for years with back pain, I allowed Dr Sam to perform spinal decompression on me and after several weeks of treatments, I was amazed that the pain went away. I would strongly recommend Dr Sam and his staff for any pain or ailments that you may have." "Yesterday was my first visit, had difficulty going up the steps to the door, was in so much pain and out of adjustment, I left after my first visit much better. Today Dr. Sam gave me my 2nd consecutive adjustment, WOW.... I feel soooo much better....Thank you...Thank you... Thank You...."
"As a busy teacher, I love visiting Dr. Sam and Dr. Brad for adjustments. I also highly recommend Alisa for massage therapy. I went this morning, and am still relaxed and pain free! Thank you!"